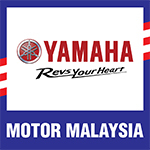 KUALA LUMPUR, 23 JULY 2016 – Hong Leong Yamaha Motor Sdn. Bhd. 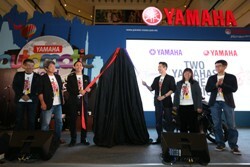 (HLYM) today revealed their collaboration with Yamaha Music (M) Sdn. Bhd. 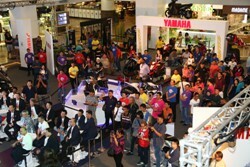 The collaboration announcement came after HLYM Managing Director Dato’ Jim Khor revealed their newest Automatic model, Ego Avantiz, to the public during the Yamaha Automatic World Motorshow in Berjaya Times Square. 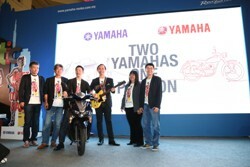 Dato’ Jim Khor was joined by Managing Director of Yamaha Music (M) Sdn. Bhd. 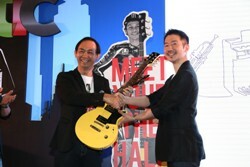 Mr. Nobuhide Ito on stage to officiate the collaboration through an exchange of mementos with Dato’ Jim Khor holding a guitar and Mr. Ito riding on the newly launched automatic motorcycle model on stage to signify the collaboration. The collaboration was initiated through a series of discussion with the sole objective of tapping onto strengths of both parties in their efforts to expand the Malaysian segment in the motorcycle and music industry. Furthermore, with the current trend towards “Living a Lifestyle”, both parties are able complement each other in co-branding, ground promotions, cross-selling and customer base penetration. 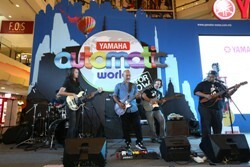 The Yamaha Automatic World Motorshow is one of the first in a series of activities that both Yamaha companies will co-brand on. With the strength of Yamaha Music in the fields of education and Yamaha Motor’s strong marketing and customer touch point experience, it is evident that both parties will benefit significantly from each other through this collaboration. As a symbolic gesture to solidify the collaboration, an announcement was made to give away an attractive Yamaha headphone to the first 100 Yamaha Ego Avantiz registered owners. The huge crowd who attended the ceremony were also entertained by a string of performers which includes dancers, Yamaha Music endorsees, stunt riders and many more. The event will definitely be earmarked as another major successful milestone in the historical journey of both Yamaha companies.